iBall has launched there latest smartphone, the Iball Andi 4.5P Glitter. 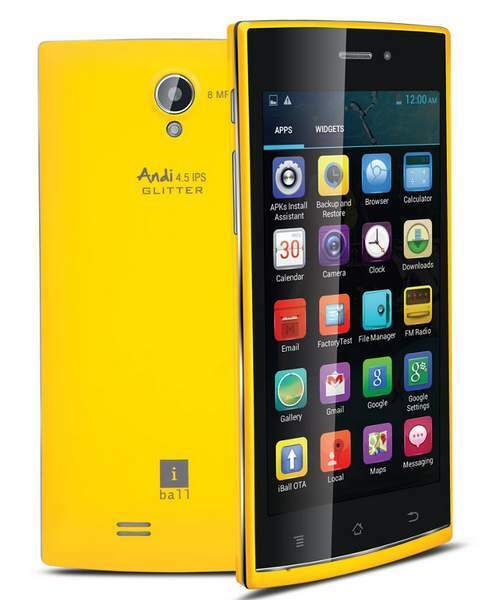 The new Andi 4.5 p Glitter is priced at RS7399. It has 4.5 inch 480 x 854 pixels FWVGA IPS display and 1.3GHz 4-core CPU. It runs on Android 4.2.2 Jelly bean and supports DUAL SIM. It would compete with recently launched Xolo A510S. It features 3G, Bluetooth, GPS, WiFi up to N and FM radio. It has 4GB of ROM and 512MB of RAM, LOW ! . For Video and Photography there is 8-megapixel primary shooter with LED flash and a font facing camera ( unknown resolution ). The expandable storage is up to 32 gigs via micro SD card slot. The iBall Andi 4.5P Glitter is powered by 1450 mAh battery. It is available in White and Yellow colors. The company has also launched the iBall Andi 3.5KKe Genius and Andi 3.5KKe Winner with 3.5 inch HVGA display.